Allan Hills Edge Tool Co. The Allan Hills Edge Tool Co. operated under that name between late 1909 and 1916. One reference to the Allan Hills Edge Tool Co. included a caveat that they were "Est. In 1844." That dating most likely referred to their earliest predecessor, The Galt Axe Co. Reports indicate that Allan Hills was listed as being active in Galt, Ontario, ca 1861. That activity primarily involved steel making but Hills may have had a secondary involvement in edge tool manufacturing. Hills may also have been involved with the Galt Axe Co. by sharing space with that company considerably before he, or the company bearing his name, actually acquired the company that had taken over the Galt Axe Co. The Galt Edge Tool Co. (est. 1844) had previously been overseen by Warnock & Co., a concern involving Adam and James Warnock. In 1870, the Warnocks agreed to operate the business as the Galt Axe Co. They soon changed the name to the Galt Edge Tool & Carriage Spring Works. 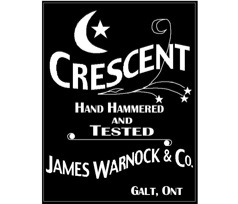 That arrangement continued even after Warnock & Co. changed names and became James Warnock & Co. James Warnock ran the operations until his death in 1898. Management was turned over to F. H. Hayhurst who oversaw the operation of the company until late in 1909 and possibly for a while after Hills took over. 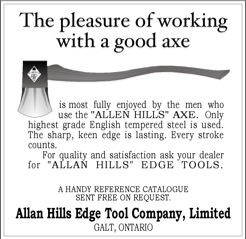 The name Allan Hills Edge Tool Company started to be used publicly in 1910 with an announcement that indicated Allan Hills had taken over the plant at the same location as where Warnock & Co. had been located. Advertisements for Allan Hills in 1910 issues of Hardware & Metal magazine included various Warnock & Co. labels. The Warnock brands appear to have been marketed until 1914 which suggests there may have been an extended transition period. Records indicate that Allan Hills died in 1916 and the company was then shut down. In 1918 the facilities became the Galt Hat Co.
Facsimile of label carried over from James Warnock & Co. and used by Allan Hills Edge Tool Co.
Facsimile of advertisement as it appeared in a 1914 copy of Farmer's Magazine. 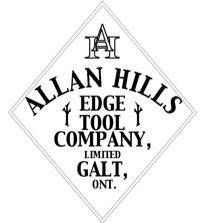 Facsimile of a label used by the Allan Hills Edge Tool Co. Early mark observed on a hatchet.